In the dozen years since we came together to create an ambitious Revitalization Plan for Downtown Las Cruces, much has changed nationally and regionally, as well as in our City. So it’s time to look again at our Downtown ambitions and at strategies for making the most of what’s coming our way. Won't you help us? Click here for answers to all your Downtown Master Plan questions. PARTICIPATE > Got ideas to refine downtown's Master Plan? Join us! In the meeting of December 5, 2016, Las Cruces City Council adopted the update of the City’s Downtown Master Plan. Review the adopted document here (20mb .pdf). Or, purchase the report in a magazine-quality format here. The Council’s approval of the Downtown Plan is the latest in a series of plan and coding updates shaped through community collaboration. Just one popular outcome of those efforts: The new Plaza de Las Cruces, which has already been embraced by residents and visitors alike. As promised, we’ve incorporated your tweaks into the update of the Downtown Master Plan. Now comes the official review process that ends with the Las Cruces City Council’s consideration of the Plan’s adoption. You can see the latest draft here. The constructive collaboration that involved so many of you improved our process through every stage. You can review those steps in the diary posts immediately preceding this one and reacquaint yourself with project goals here. Opportunities for comments and questions aren’t over, of course. You can continue to pose them here or directly to staff here. The next public meeting to discuss the proposed plan will be the TIDD Board on July 25, 2016 at 1 pm. Watch for announcements on the City website about upcoming public meetings that are part of the standard review process, including details about when the final draft Plan goes before the Council. We hope you’ve already saved the dates for our 1-hour special presentation on Wednesday, June 22, likely to draw a big crowd to City Hall City Council Chambers. The Wednesday event is a segment with national residential market consultant Laurie Volk, who leads off from 10 to 11 a.m. with a talk about the theory and tools of successful urban dwellings. She will focus on the latest research about Las Cruces’s Downtown and help lead a discussion about opportunities to accelerate Downtown’s success. Get a downloadable/printable event flyer here. 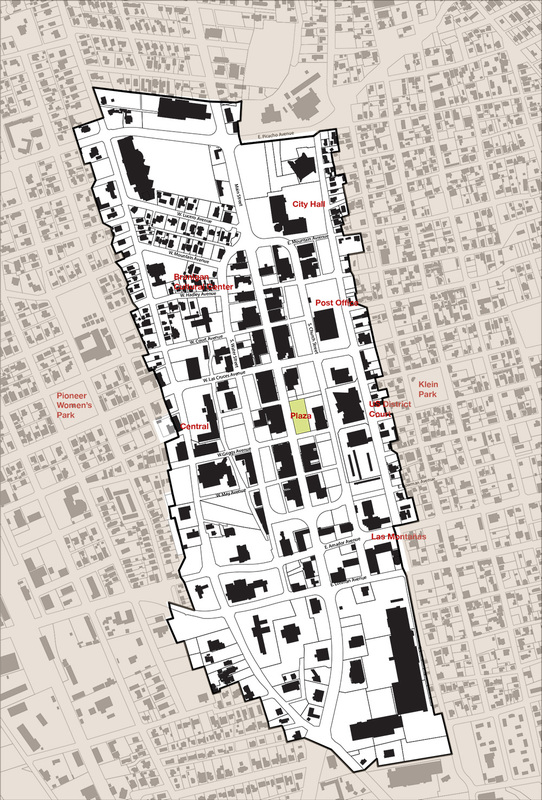 With the Las Cruces City Council’s unanimous approval of a new zoning approach for the Downtown, the ongoing update of the 2013 Downtown Master Plan gets an important implementation tool. What’s important about the just-passed zoning code is that it enables many of the goals affirmed during public discussions and workshops. Key among those goals: A less car-dependent Downtown with plenty of walkable options for living, working, shopping and entertainment. Earlier this year, many of you were partners in collaboration on an update of the Downtown Master Plan for Las Cruces. For a reminder of how productive that process was, take a look at the summary post from the closing night of the February planning workshop. The initial draft of the Plan that began to take shape by the end of that workshop is now ready for public comment. You can see it here. Now, it’s time to renew the collaboration. We’ll be taking your comments on the draft through July 15 here on the website and via email directly to City staff here. Four days of community collaboration on the update of Las Cruces’s Downtown Master Plan concluded Friday evening, February 19, with a few reminders and with recommendations for key next steps. The reception from attendees, many of whom attended multiple meetings during the four days, was enthusiastic. The four days of community collaboration on the update of Las Cruces’s Downtown Master Plan concludes Friday night. The final event: A presentation and discussion by the project’s consulting team. Everyone’s invited. The session will be held in City Council Chambers, City Hall, 700 North Main Street. The message from urban retail expert Bob Gibbs in his presentation to residents and business people on Wednesday, February 17, was the level of pent-up demand for stores, restaurants and lodging in Las Cruces’s Downtown and in nearby neighborhoods. With almost 70 people crowded around tables in the Shannon Room of the Branigan Cultural Center Tuesday evening, February 16, Las Cruces’s four-day collaboration on a next generation Master Plan for downtown got rolling. The opening night task: Affirm key spots in the Downtown project area where the advantages of city life seem to be already emerging and additional places where the potential for even more activity is promising. We hope you’ve already saved the dates for our four days of collaboration on Las Cruces’s new Downtown Master Plan. The time, place and topics for all the meetings are here.